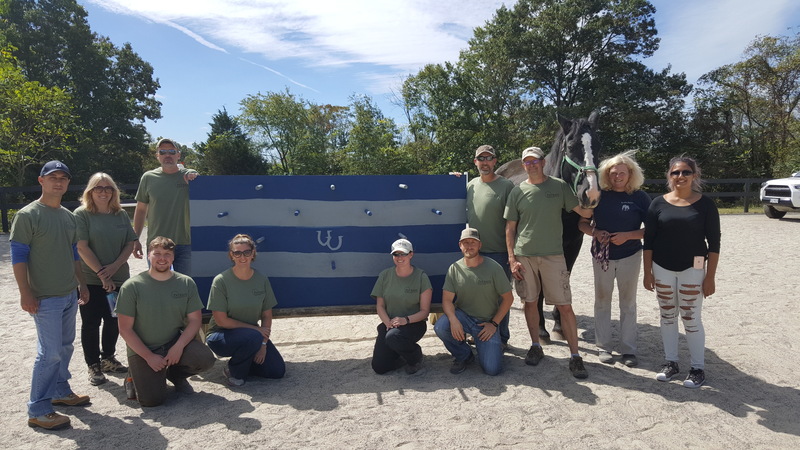 It was a perfect early Fall day last month when PGI staff spent the day volunteering their time and talent at Bridle Paths in Leesburg, Virginia. Located less than 10 miles from historic downtown Leesburg, Bridle Paths is a nonprofit organization that offers strength, support, and healing to individuals and families through safe, effective, and high-quality equine-assisted activities and therapies. Integral to the success of Bridle Paths’ programs are volunteers, who help out in a variety of ways. On September 29, the PGI team came together to help construct training aids for the various exercises that clients participate in while at Bridle Paths. In addition to donating time, labor, and materials for this project, the PGI team had the opportunity to observe a therapeutic session and participate in a mock session. Bridle Paths’ programs serve those with a wide variety of needs and diagnoses, including brain injuries and physical disabilities, cognitive impairments, post-traumatic stress, anxiety and depression, seizure disorders, and experiences of abuse and trauma. By combining the ground-based activities of equine-assisted psychotherapy (EAP) and the mounted and horsemanship activities of therapeutic riding, Bridle Paths’ programs offer individuals with special needs approaches to the everyday and exceptional challenges they face.